taken control of the chimaera's rebellion and is intent on steering its course away from dead-end vengeance. The future rests on her. 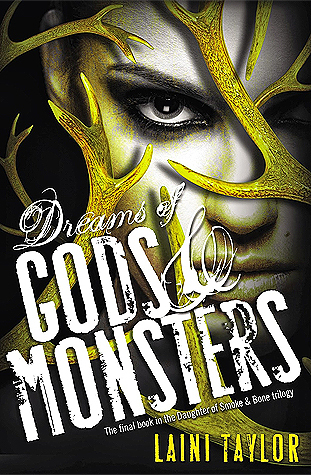 The New York Times bestselling Daughter of Smoke & Bone trilogy comes to a stunning conclusion as - from the streets of Rome to the caves of the Kirin and beyond - humans, chimaera, and seraphim strive, love, and die in an epic theater that transcends good and evil, right and wrong, friend and enemy." This series is so unique and so beautiful and this conclusion delivered. The reader has been put through so much heartache and pain and with this one we finally get our answers and some happiness. This whole series has been a great ride. Karou and Akiva. My gosh. Their story has been the sweetest mix of agony and wonder. They have traveled a long, dark, and hard road, but watching them work their way to one another was beautiful. I absolutely adore these two and they deserve all the happiness in the world. One of my very favorite couples. And I also love the side characters. Zuzana and Mik are the best. I have such a soft spot for the wonder that is Zuzana. And Issa is another favorite of mine. Love her to bits. And Ziri. Oh how I love Ziri. And just so many more. These characters come together to create such a great cast and world. Laini Taylor really created something special with this story and this world and I’ve loved it. My one complaint with this one that held me back from loving it as much as the first two was the end. There was just a bit too much open for my taste. Don’t worry, you get a conclusion, but there are just a few threads I would have liked to see fully wrapped up. Other than that, it was fantastic. This series has been such a ride and I’m so glad I finally made time for it. If you’re like me and haven’t read these yet, I highly recommend you do so ASAP. Have a wonderful week, Teresa! Guess I'll be moving this series up in the queue. ;) I'm glad it ended so well and that you enjoyed the series as a whole so much, Teresa. This trilogy is on my want list for a long time. I've heard so many good things about it. I just need to borrow them from the library and read them. I wonder if they author left some things unanswered because there will be a spin off?